AFTER FELIX WENTto Rome a new governor was sent to take his place. This new governor was called Festus. Now, Festus was also a Roman as was Felix. He was unacquainted with the Jews and knew little about their customs, religion, and such things. He went to visit Jerusalem three days after he arrived in Caesarea; for there he could learn more about the people he had come to govern, as Jerusalem was the Jews’ chief city. Paul rose up, stretched out his hand on which hung the heavy chain, and said: “I am glad, O King, that I may speak for myself today before you, and tell why I am accused by the Jews. I know that you understand the customs and questions which are among the Jews, and you will understand my words. “From my youth the Jews know my life, for I was brought up in their city. And if they would, they could testify that I lived among the strictest of the Pharisees, keeping the law of Moses as carefully as any of them tried to do. And now I am accused by them because I believe the promise which God made to our fathers, concerning Jesus Christ, whom God raised from the dead. “The time was when I, too, thought I ought to persecute those who believe in Jesus of Nazareth. And this I did, shutting in prison many of the saints who lived in Jerusalem. I even received authority from the high priest to persecute the saints who lived in distant cities. I was on my way to Damascus to persecute the Christians there when I saw a vision from God. It was at midday, O King, when suddenly I saw on the road a light from heaven, more dazzling than the noonday sun, and the brightness of it frightened me and my companions. We fell to the ground, then a voice spoke to me in the Hebrew language, saying, ‘Saul! Saul! why are you persecuting me?’ I cried, ‘Who are you, Lord?’ and the voice replied, ‘I am Jesus, whom you are persecuting.’ That voice commanded me to stand on my feet while I received Jesus’ orders. And that voice told me I should tell of Jesus, not only to the Jews, but to the Gentiles as well. But the King was not ready to humble his proud heart and become a Christian. 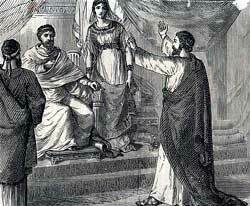 He rose up at once and went aside with Bernice and Festus and others to discuss Paul’s case. He said to Festus, “This man has done nothing worthy of death or even of imprisonment. If he had not asked to be sent to Caesar he might be set free at once.” But now it was to late to change the arrangement, and Festus could not set Paul at liberty.